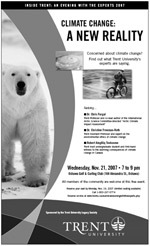 Over 100 members of the Oshawa community braved the first winter storm of the season to attend Inside Trent: an Evening with the Experts held on Wednesday, November 21 at the Oshawa Golf and Country Club. Attendees included alumni, parents of Trent students and members of the community. At the event, three experts from Trent, two professors and one undergraduate student, discussed the topic of “Climate Change: A New Reality”. The experts were: Dr. Chris Furgal, a professor of the Indigenous Studies Department and the Environmental and Resource Studies program at Trent and the co-lead author of the Nobel Prize-winning International Arctic Science Committee-directed “Arctic Climate Impact Assessment”; Dr. Christine Freeman-Roth, a philosophy professor who is well-versed on the environmental ethics of climate change; and Robert Tookoome, an Inuit student who has seen first-hand the alarming consequences of climate change in Canada’s north. Dianne Lister, a Trent alumna and current vice president of external relations and advancement at the University emceed the event, which was sponsored by the Trent University Legacy Society. For more information on the event, and to view copies of the experts’ presentations, visit the Inside Trent website. The new Inside Trent series was launched in Peterborough in May 2007 with a Lunch with the Experts event. To be held on an annual basis, the series is designed to bring Trent’s experts to the community to facilitate a sharing of knowledge on topical subjects.